For Chris Morris, Woodford Reserve’s master distiller, doing things differently is essential. As the American whiskey boom continues, he’s keen to show just how experimental and diverse the category can be. When Chris Morris joined Brown­-Forman 42 years ago, the US spirits group was a very different operation. Back then, the Jack Daniel’s maker was not the large international player it is today, and it had not yet created the brand that would go on to pioneer the premium Bourbon movement: Woodford Reserve. 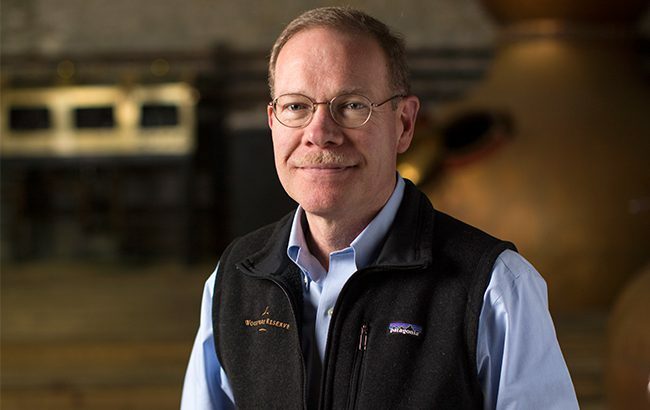 “We were an old whiskey company with brands such as Old Forester, Early Times, a little bit of Jack Daniel’s and brands that don’t even exist anymore, so we have come a long way,” reflects Morris, who was appointed Brown-Forman’s master distiller with responsibility for Woodford Reserve 15 years ago, when he succeeded Lincoln Henderson. Morris’s mother worked as an artist, creating advertising and promotional materials for Brown­-Forman, which is headquartered in Louisville, while his father started out at the Old Forester distillery before moving into management. Morris’s daughter is now continuing the familial connection at Brown­-Forman, working in its lab. Morris himself cut his teeth as an intern, working in Brown­-Forman’s grain lab. He went on to gain experience at the group’s cooperage, its Jack Daniel’s distillery and its Tequila distillery in Mexico. After an eight­-year stint at Glenmore Distilleries and United Distillers, Morris rejoined Brown-­Forman in 1997 as its consumer development manager, becoming master distiller in training in 2000. From the outset, he had an ambition to do things differently at Woodford Reserve, and admits that a flippant attitude towards American whiskey in the industry ignited a fire in his belly. According to Morris, the spirits writers and commentators of the day praised Scotch for adding excitement to the industry through cask-­finishing and other innovations, but lamented what they saw as a lack of creativity among American producers. Under Morris’s lead, Woodford Reserve set out to build a “rock-­solid foundation” in traditional Bourbon before releasing more experimental expressions onto the market. In a bid to “do something no one else was doing”, the distillery pioneered barrel finishing in Bourbon in the late 1990s, and has since launched Bourbons finished in fortified wine casks such as Port and Sherry, as well as single­-varietal wine casks such as Pinot Noir and Chardonnay. In addition to cask seasoning, Woodford Reserve has experimented with different types of wood and barrel treatments. For example, in 2012, the brand launched its Double Oaked expression, which takes Woodford’s classic Bourbon and matures it for a second time in barrels with a longer toasting and shorter charring period. One of the brand’s most recent releases – Woodford Reserve Baccarat Edition – showcases Cognac as an “appropriate flavour complement to Woodford”. The limited­-release Bourbon, bottled in a Baccarat crystal decanter, has been finished in a variety of XO Cognac casks for three years. Costing US$1,500, Brown-Forman said the expression “elevates the category of American whiskey in the global market”. For Morris, it is “the first step in a long journey of this style of finished expression”. Through its Master’s Collection and Distillery Series, Woodford Reserve is aiming to show drinkers that just one adaptation in the whiskey-­making process “can make a terrific difference” to flavour, says Morris. The distillery aims to “keep it simple” by highlighting one element in each of its innovative bottlings to prevent the consumer from becoming overwhelmed and confused. “How can a consumer understand what makes a whiskey taste a certain way if it has 10 changes? We want them to go ‘oh, that’s the reason it tastes that way’,” Morris says. “I learned early on that the more complex you make the process, the more confused even the most experienced whiskey drinker will get, because no one is as knowledgeable as they think they are – I’m certainly not. Morris also has no qualms about Woodford Reserve’s core Bourbon recipe having evolved over the years. “I wouldn’t want to drink the first batches of Woodford Reserve today,” he claims. “We have our own cooperage, so we have evolved the Woodford Reserve barrels; we are on the third generation of barrels, and they are getting better. We have improved everything along the way. Bourbon’s boom in popularity is no secret – last year, sales of American whiskey were up by 8.1% to US$3.4 billion. 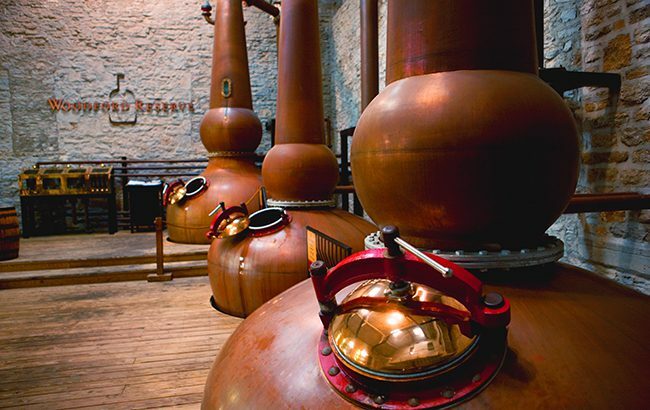 Many distillers have announced significant investments to ramp up production, and Woodford Reserve is no exception. In 2013, the distillery embarked on a US$35 million expansion and “continues to invest a lot of capital”, according to Morris. As such, Woodford Reserve is “in very good shape” when it comes to supply.